When Sports Illustrated released it's first issue on August 16th, 1954 many thought the sports geared periodical would live a short life due to the existence of magazines like LIFE. Ironically, nearly 60 years later LIFE is dead, with the name more commonly associated with a board game or kids cereal than a picturesque periodical. Meanwhile, 2,800 issues later, the world's first major sports publication pushes on. The pioneering sports magazine's latest cover conjures up memories of a simpler time in both Sports Illustrated's history and the game of Baseball's. This past week, Twins' slugger Jim Thome and the Twins' new stadium Target Field took center stage on the cover of the September 27th, 2010 issue. If you haven't seen the cover, it features one of the best pictures to ever grace the cover of the storied magazine, a photo that perfectly captures the infectious nature of baseball and ironically draws upon SI's history in the process. The cover is tagged with your everyday play-on-words headline, in this case a play on Minnesota writer Garrison Keillor's "Prairie Home Companion", although clever, it's the cover art that steals the show. The point of any photo, picture, or painting is to tell a story or capture a moment in time that doesn't require words. The Thome cover paints the perfect picture of the Twins' new monument to America's past time, the rebirth of a throwback slugger's career, and the Twins pursuit of the Fall Classic playing old school baseball in a new school world. 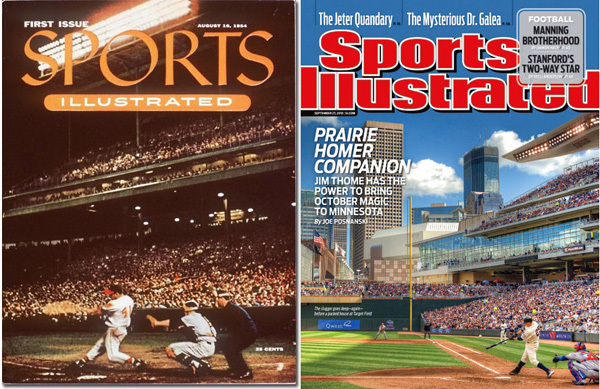 When I first saw the Thome cover, it felt very familiar, and not just because I am a Twins fan from Minnesota, it had a certain timeless feel to it. Then it struck me, the cover was an a homage to the first ever Sports Illustrated, Issue #1, which released on August 16th, 1954 and featured Brewers' star Eddie Mathews swinging for the stands at Milwaukee County Stadium. The Thome Target Field cover is an instant classic in my book, as it brings the history of baseball and the oldest sports publication full circle in one fell swoop, or swing in this case. 2010 Sports Illustrated Minnesota Twins Jim Thome Subscription Issue Exc. 1998 Sports Illustrated Ken Griffey Jr Extra Edition 95 250 #51 Graded PSA 10!! !